I’ve got some more writing on bills to post, and it looks like someone has some explaining to do. I don’t know who this Linnsey is, but someone is very sorry about something that they did to them. 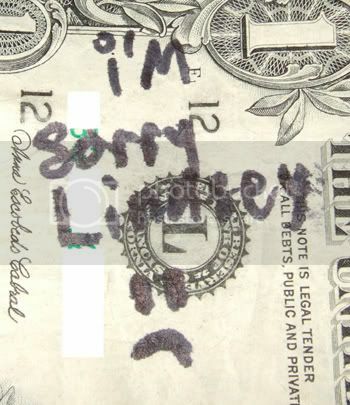 I have this whole story imagined in my head where someone did something terrible to Linnsey, Linnsey walked out and this mystery person never got the chance to apologize to them, so they had to write their apology to Linnsey on as many bills as they could get, hoping that the message would get through. 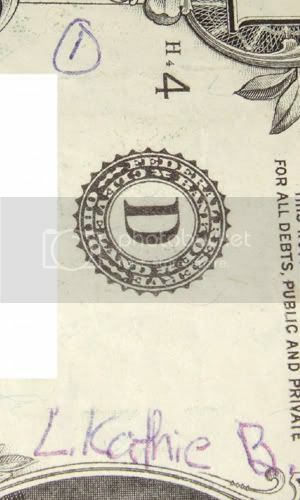 Speaking of names on bills, I found this one. I don’t know who L. Katie B. is, but she must think she’s #1 or a 1 with a circle around it or something. I have to wonder what the L and B stand for. 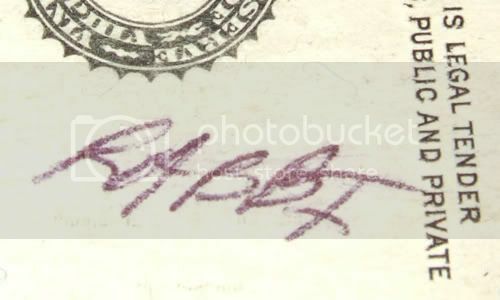 I’m assuming that Katie is a middle name and that L and B are the first and last initials, respectively. Maybe the full name is something strange like Leopold Kathryn Bartholomew or something and she never liked going by the other two names, as it often caused confusion. It could also be that L and B stand for some attributes that she thinks she has, like Lovely and Beautiful or something. Maybe she is and maybe she isn’t. I don’t know either way. This one is pretty straightforward. It’s just “RABBI”. Now, is the person who did this a rabbi? Do they know one? Are they trying to catch the attention of a rabbi so that they might seek council or something? If so, how does the rabbi get in contact with the person? I know, it’s a bit of a stretch, but I’m trying to make the text here long enough to go down below the picture. I haven’t yet figured out how to format the entries so that it’s done automatically. Either way, I’m curious what the person was trying to accomplish with this. 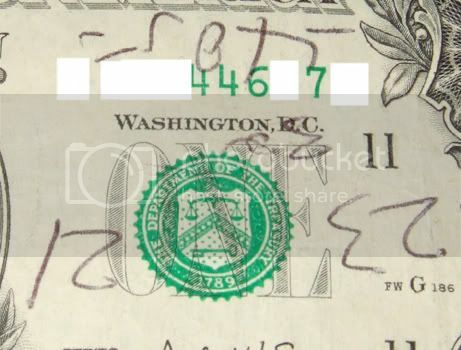 It might just be a case of someone using a bill for scrap paper. This is definitely a case of scrap paper. You have to wonder what would make someone think of reaching for currency to use as scrap. I mean, are you really that short on paper? Can’t you go out and use the bill to get a pad or something? I’ve always wondered about the thought process involved in actually seeing money and making the connection with using it as scrap. It’s not even a matter of legality or anything. What makes someone think that the rest of the world wants to look at their random words, numbers and squiggles? I don’t know, but I’ll keep posting them here. Hmm, I don't recognize the handwriting.